The Wars of Pooch: 6 Day Para Challenge 3- Beep Beep! Well, I managed to get a good few hours of painting in last night; and the question you are all asking, how much is finished? 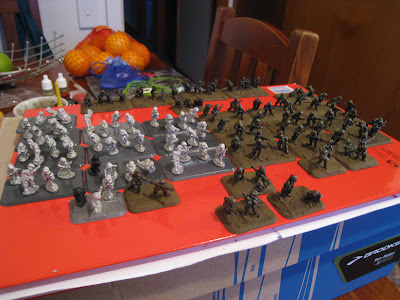 Well... nothing.... but I have one full platoon and my company HQ ready to base (I just haven't worked out how I am going to do that yet), my mortars are about an hour away from done, as is my Airborne Recon Platoon. There is the army as a whole, 2 Para platoons, one painted one not, the Company HQ with attached bazooka, and the 4 tube mortar platoon at the back. 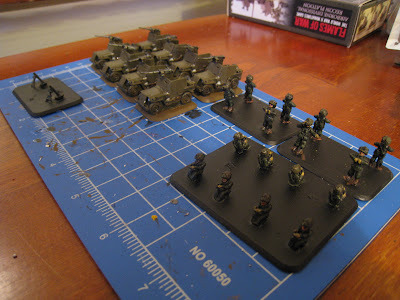 And this is the Airborne Recon Platoon- with the crew out on the bases so they get painted properly, with the armoured bathtubs in the background. The jeeps were a bit of a pain to assemble, the armour plate comes in 3 very fiddly parts, but now that they are done, I really like them! They are basically Universal Carriers but Fearless, with armour 0 all around, and armed with a .50cal, these guys should be awesome!